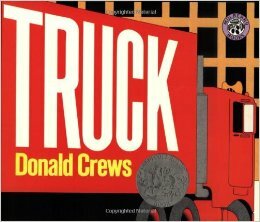 This month for Virtual Book Club for Kids we are spotlighting three books by Donald Crews! 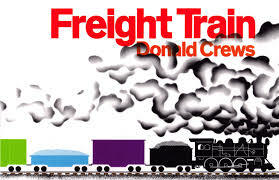 I decided to focus on our favorite book... Freight Train... since my toddler loves all things trains! Shapes are everywhere and my kids have always been really interested in shapes and trying to find them in their environment. 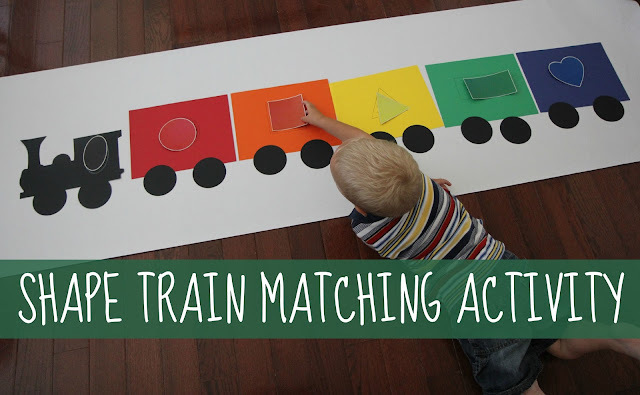 Today I am sharing a simple shape train matching activity that gets kids practicing matching colors and shapes using a our giant floor sized train! To get started you need to make your train! Your child can help you or you can prep this part ahead of time. Start by cutting an train engine out of black cardstock (I printed off an engine outline and traced it on the black and then cut it out). Next use your circle punch and punch two large circles for each train car and the engine (total of 12 circles). After that, roll out out your easel paper and place the train pieces on the easel paper starting with the black engine and then moving through the rainbow of colors. Use one piece of colored cardstock per train car. Add wheels to each train car and the engine and your train is built! Secure in place with tape. Next, grab your shape printouts and cut them out, leaving a thin white edge around each shape. Use the shapes and a marker or crayon to then trace a shape on each train car (black oval on the black engine, red circle on the red train car, etc). 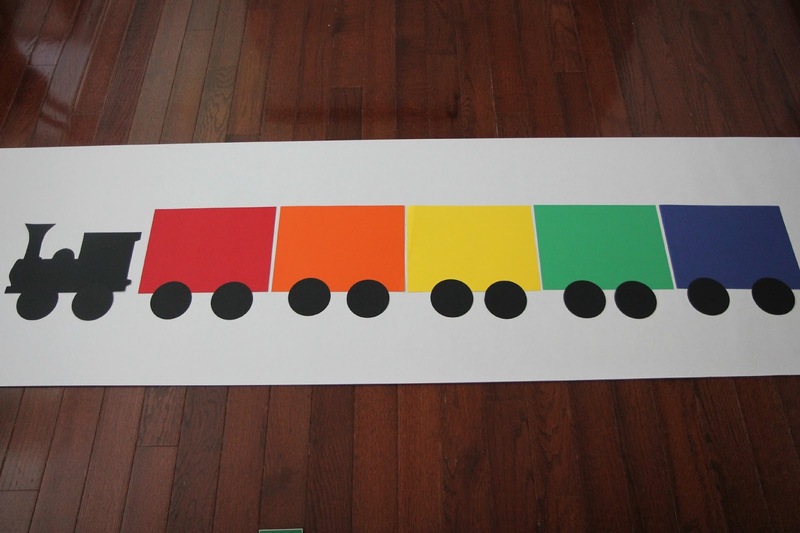 Write the names of the shape and color on the train car shapes as well so that kids can get used to the seeing the words written out and can begin to identify them. Now you are ready for the matching activity!! Place all of the shapes in one spot and encourage your child to find a shape and place it on the correct matching shape train car. You can even hide the shape pieces around your house ahead of time to make this activity even more fun. Laminate the shapes if you want them to be more durable. Once your child has matched all of the shapes then you can clear them off and play again! We had fun doing little competitions to see how quickly we could match the shapes and if we could say the names of the shapes or the colors of the shapes. All in all this was a super simple activity to do together and my son was in awe of his giant train the whole time! He thought it was so cool! 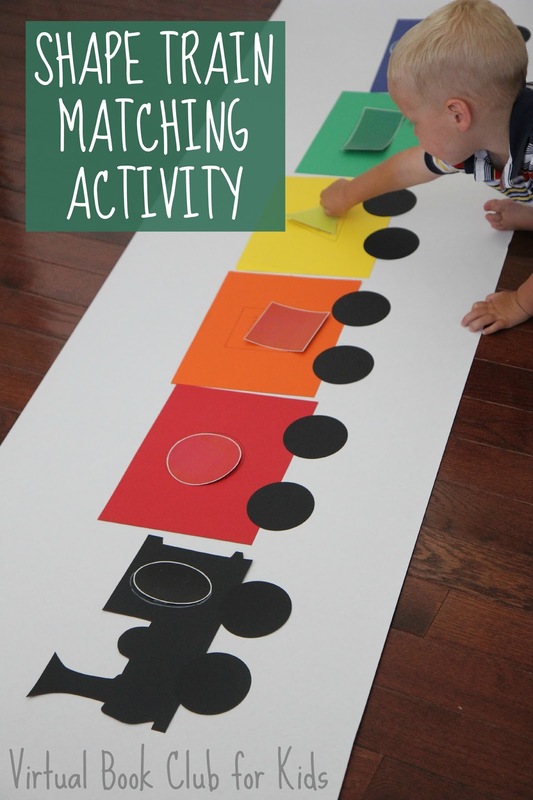 It would be super easy to adapt this activity to focus on a different skill like number recognition or alphabet matching. We've made an alphabet matching train before that was really fun too! 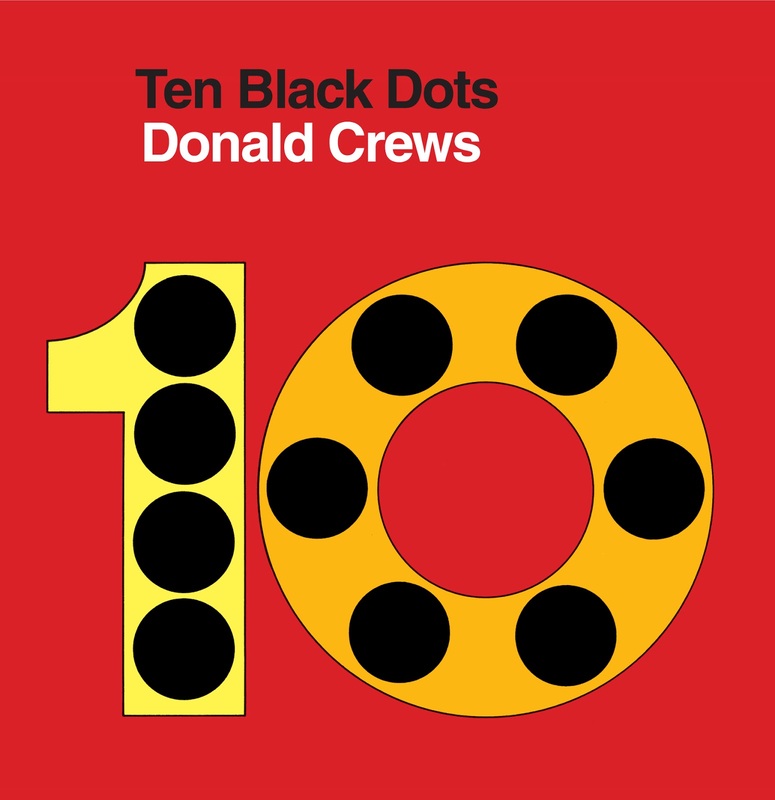 You can find more Donald Crews book inspired crafts and activities shared over on our Virtual Book Club for Kids Facebook page this week. I love that this over sized and encourages kids to get down, move and interact! Fabulous activity - going to give it a try with T as we need to work on shapes more.